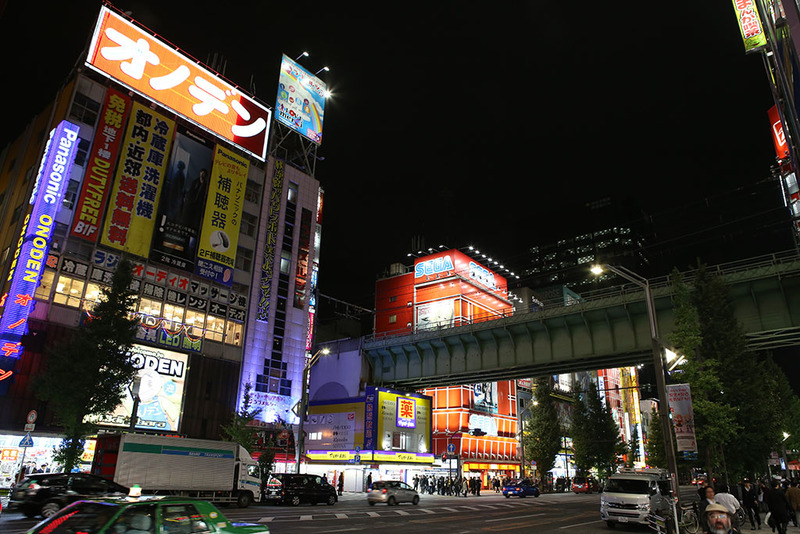 Right off the bat from the station, you enter into the madness and spectacle of Akihabara – which is even more impressive at night when all the lights are going and the streets filled with people after working hours. 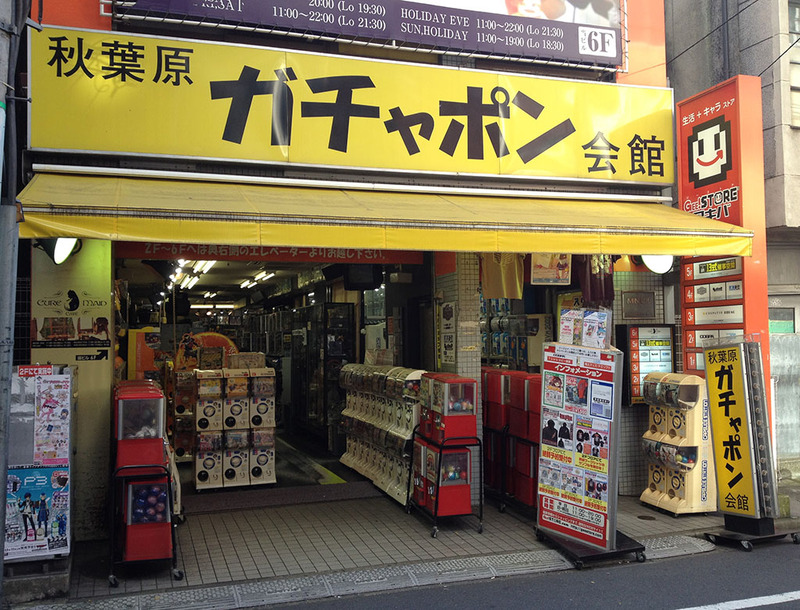 One of the first shops you’ll run into outside the station is actually a unique Japanese phenomenon: showcase rental shops. These shops simply provide locked display cases full of private owner’s collections. This particular one is called AStop. It had been an electronics store, but was slowly going out of business. When the owner put some of his toys out for sale, they sold for far more than he imagined. Then he had a brainstorm. Why not have display cases people could rent and sell their own things? For about $20-60/mo you can rent your own locked display box and sell, or even just boldly display, your own collections. The owners simply put price stickers on all the items in the cabinet and the staff are in charge of getting items out and handling the transactions for you. The box contents change all the time based on who is renting the boxes and what they are selling or displaying – so these are often very busy places with people checking them out quite often. You’ll see these boxes all over Japan and they are really neat ways to see people’s obsessions. Next up was one of the biggest things I wanted to try when coming to Japan. Their arcades! Sega and Taito are will be some of the bigger arcade centers you find in Akihabara, but they all follow a similar pattern. They are multiple floors with usually the first 1-3 floors being crane style games. 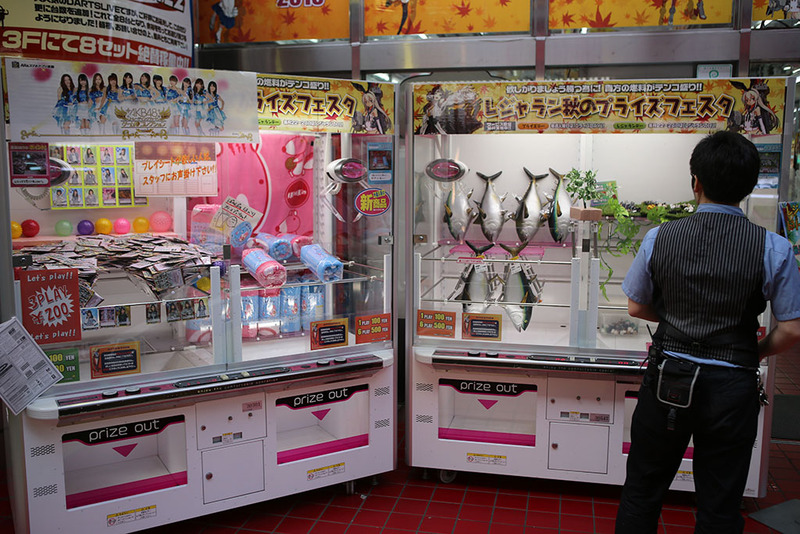 You can win everything from plastic fish to helmets to keychains to tiny stuffed animals. If it can fit in the box, then there’s probably one somewhere. I was honestly surprised how many there were as these things are notoriously hard to win. The next floors are full of what would be considered more standard arcade machines. But I was looking for one in particular. Sangokushi Taisen arcade card game. This was fascinating to watch. The machine had a large play field that allowed you to play it with a combination of a real-time strategy, boss fighting, and card game elements. The machine feeds out cards periodically from the center dispensary. The player then takes the cards and places them on the board which has different regions on the playfield marked out for different actions. Some are attack cards, other defense and other effects. At the macro level, it looks like a realtime army vs army game. As the armies collide, the heroes of each smaller phalanx duke it out in a boss-style battle. The player then takes the cards and moves them to the appropriate attack/defense/inactive states on the board which appears to sense where they are and applies the effects the times the player puts them there. As play progresses, more cards are dispensed. Quite fascinating overall. Border Break – An interesting and usually busy FPS mech-battle multiplayer game. Each person controls a mech and several of the machines are usually linked together. You would see lots of groups of young people taking turns playing each other. It’s very fast-paced and appeared to have a number of different fighting modes such as everyone-on-everyone and team vs team modes. The graphics were the best of any mech fighting game I’d ever seen, the action was fast-paced and looked quite fun. MaiMai – touch-screen based rhythm game. This was terribly popular with female players, and I personally found it quite addicting and entertaining. The game consists of touch buttons on the outside ring that you hit as each moving shape reaches the outer ring on the correct beat. The screen itself is also a touch screen and some of the more complex moves involve swiping from one button across the face of the game to another button. It was quite fun and the music was actually quite good and catchy J-pop. Anter perk is you get a lot of play out of a single coin. You get up to 3 songs as long as you pass each one. If you do well enough (A rating or better on each), you get a bonus 4th track. There also appeared to be a score saving/continuing/profile system that allowed you to get strange perks and continue your ascension to higher levels (and more unlocked songs?). I have no doubt this was one of the more popular games at the moment and was in just about every arcade I went and at least one was always being played. Bishi Bashi – this game was just complete hilarious, random nonsense. You battle your way head-to-head with up to 2 friends performing ridiculous tasks like this toilet sitting mini-game. The levels go up narrated by a game-show like host and each level you pass has a different, and more ridiculous task to perform. Great fun even to watch. 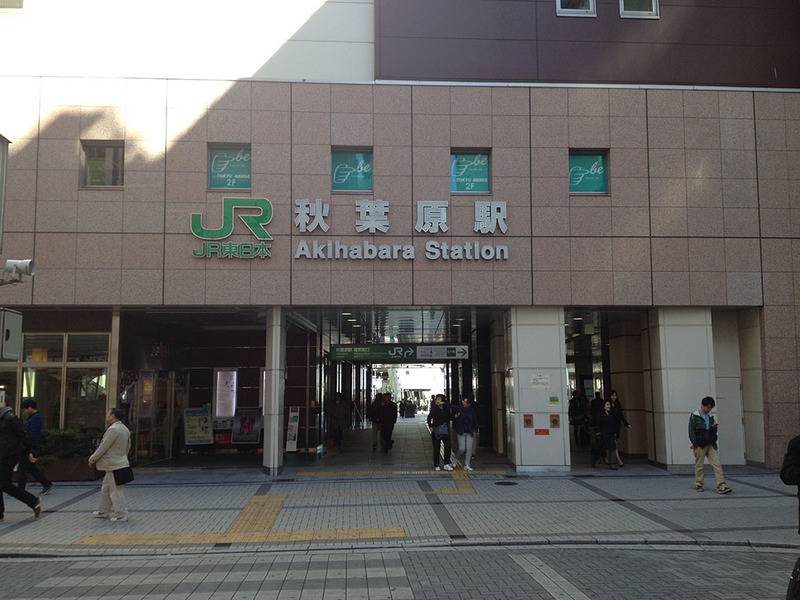 But onward – there’s a lot more Akihabara! 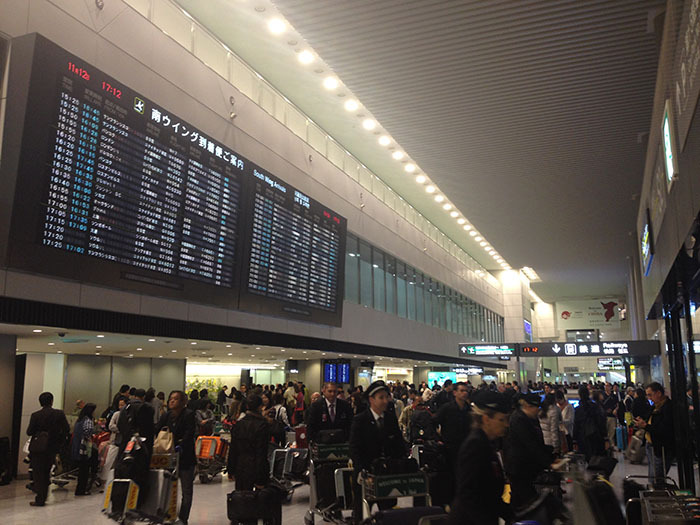 I wake up on my first full day in Japan a bit less groggy from the night before – but the jet-lag is certainly there. What to see first? 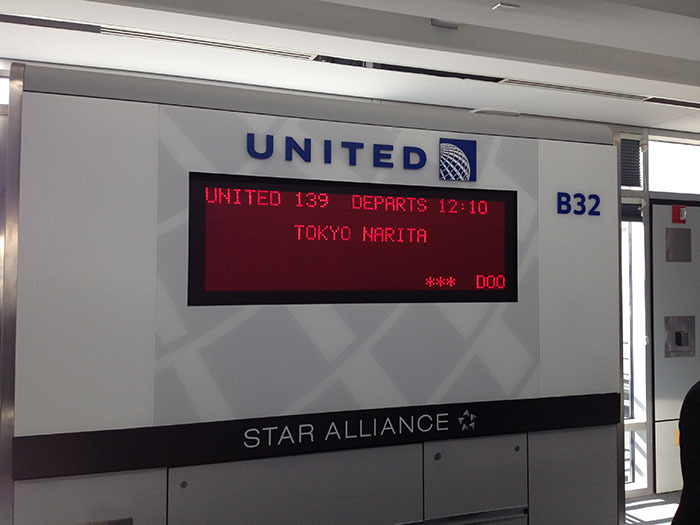 Well, it wasn’t much of a choice for me – off to Akihabara! 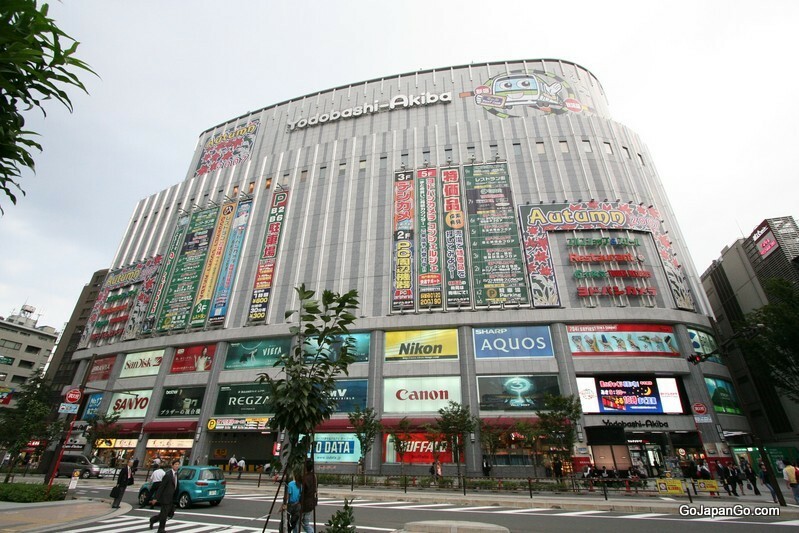 Akihabara is the world-famous electronics, gaming, and anime district. It got it’s start after WW 2 as a home electronics, radio, and post-war black market section of town. 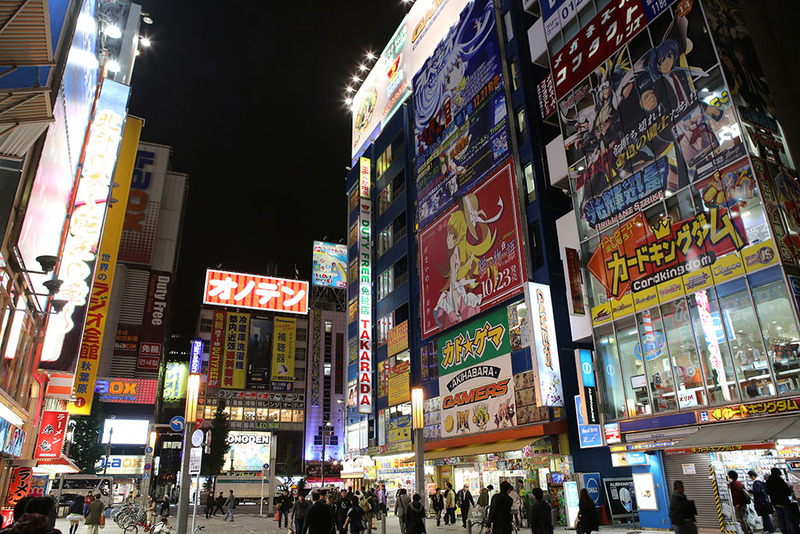 It’s most recently turned into a cultural mecca for Otaku pursuits such as gaming, anime, manga, and toys. Despite being still pretty beat up from the travel, I got started early. A bit too early in fact. 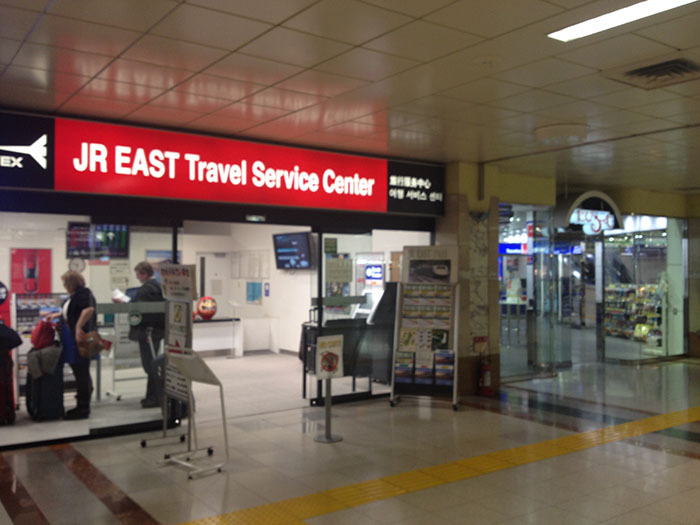 When I figured out the city rail system (using my trusty new Japanese enabled phone) I found myself there and almost all the shops were closed. Most of them didn’t open till 10am. But I walked around as I killed the last 30 minutes before they opened and grabbed a bite of breakfast to eat. At 10am, everything started to open. 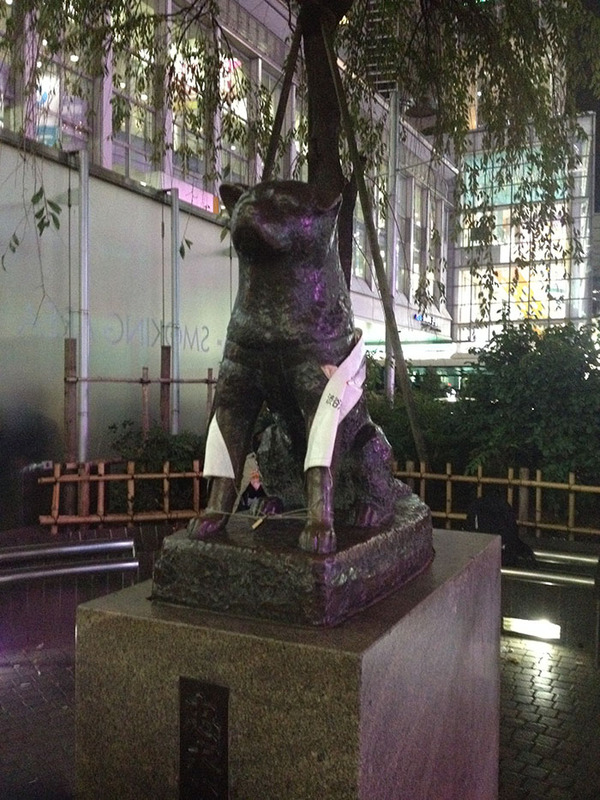 First to open was famed Yodobashi Camera. The name is a misnomer, because it’s a HUGE store with all things electronics: tv’s, computers, cameras, DVD/CD’s, video gaming, bikes, toys, PC’s, networking equipment, washing machines, etc. In short, it had everything. 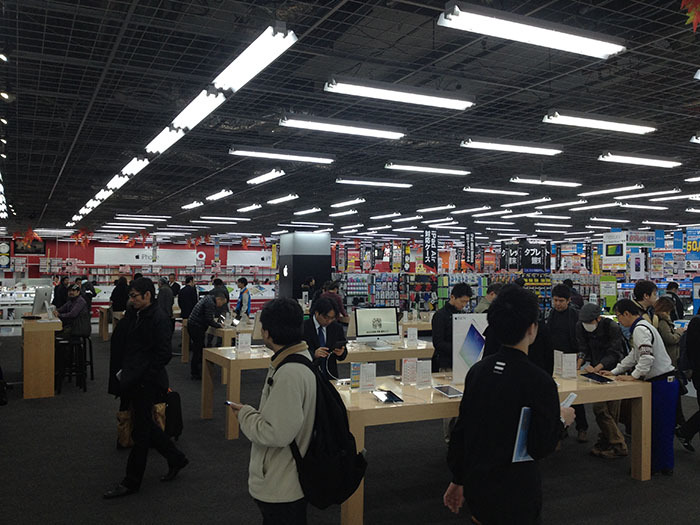 If you want a peak into what Japanese electronics and home goods look like – this is a great way to see them. I actually needed a few things I forgot: a LAN cable since the wireless in my hotel room was terrible and a mini tripod since my cheap $9 little one didn’t survive the trip very well (or, pretty much not at all). I checked out a ton of different departments – computers, cameras, DVD’s and CD’s, home appliances, toys, TV’s, etc. I finally got to computer components for my LAN cable. 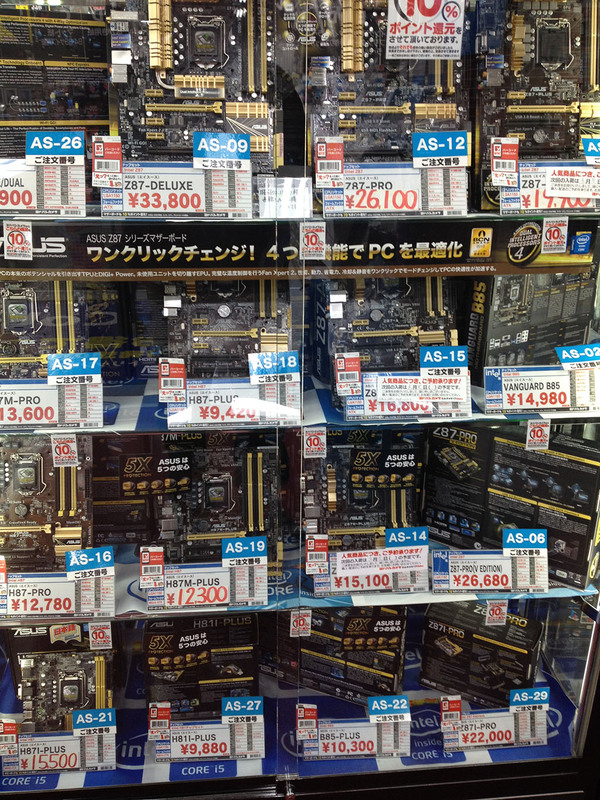 I browsed the PC parts section for fun. I was surprised to find prices for computer components were very similar to what you’d find on Newegg (within 5% or so). 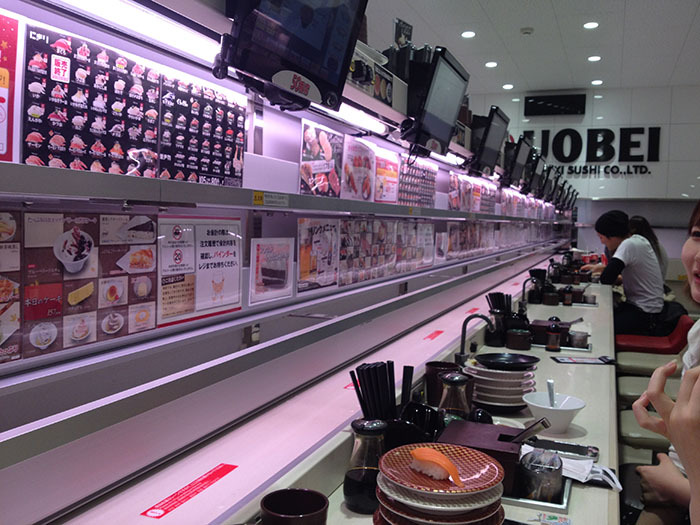 For a retail store in downtown Tokyo, I was pretty impressed. Not only that – but they had a GREAT selection of everything they had as well. They didn’t just have ethernet cables, they have every length from 1′ to 50′. Flat-style, round-style, every color, different levels of connector quality, every color in the rainbow, CAT 3 through CAT not-even-out-in-the-US. They had that kind of selection for everything: cameras, TV’s, electronics, etc. In fact, I found a multifunction internal USB 3.0 + card reader that was WAY better than any I’d seen in the states. So I bought it for only $20 when I knew similar to even lesser models were going for $50 in the US. 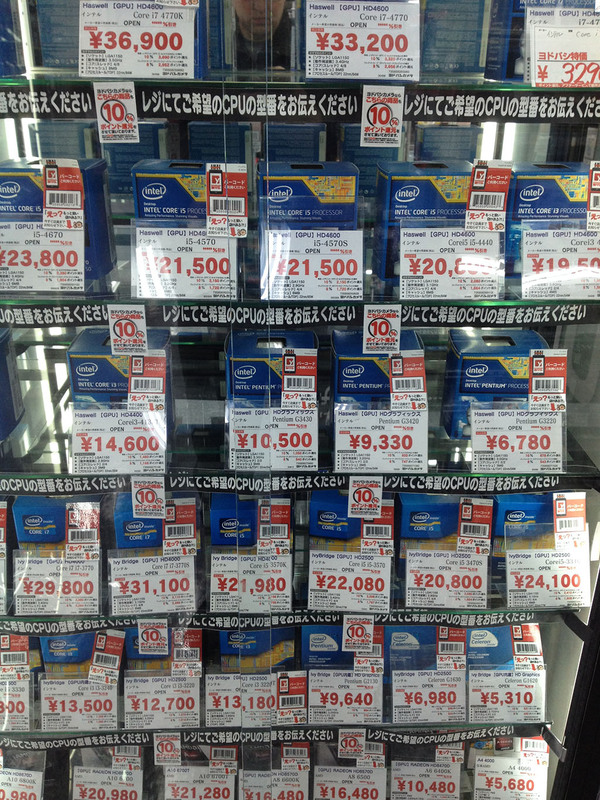 One of the more interesting points that I noticed is that Blu-ray movies were terribly expensive in Japan. While a DVD version of a more recent movie might run you 2,000 Yen ($20), the Blu-ray version might run 6,500 Yen or more ($65). Here in the states the blu-ray version might only be an extra $10 more. 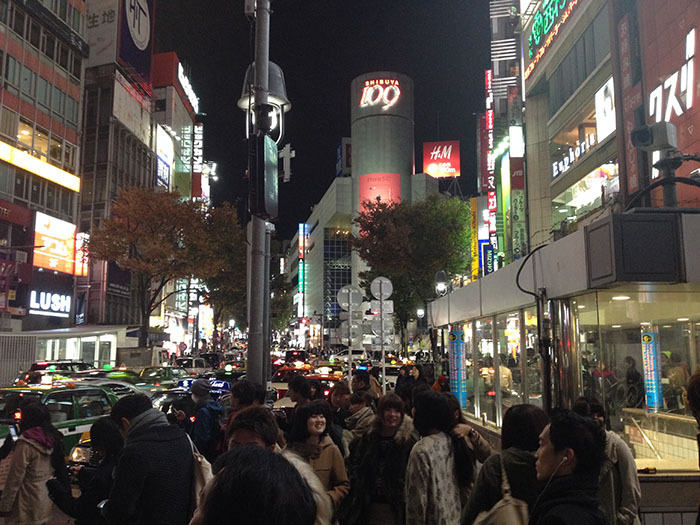 I blew a good hour and a half in Yodobashi then head back out to the rest of Akihabara. Gachapon are fun little toys distributed in plastic balls from vending machines. 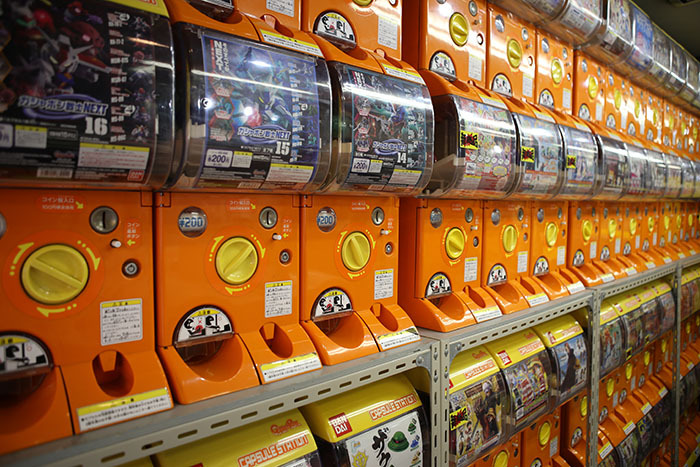 The word gachapon is Japanese onomatopoeia made up of two sounds: “gacha” for the sound of turning of a crank on a toy vending machine, and “pon” for the sound of the toy capsule dropping into the receptacle. It is used to describe both the machines themselves and the toys obtained from them. 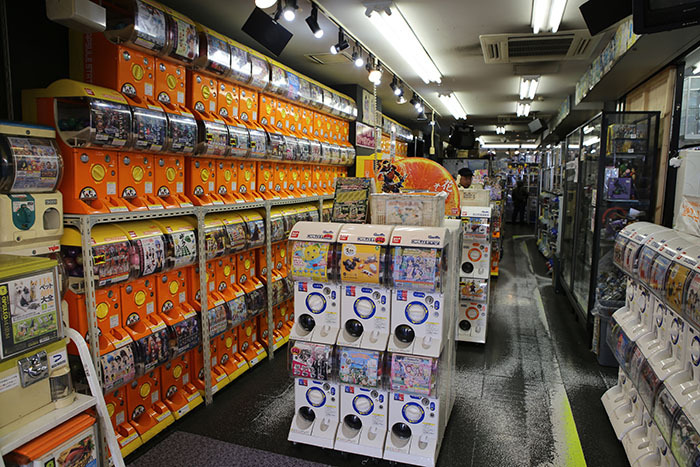 Gachapon Kaikan is probably the largest and most well known of these in Akihabara. 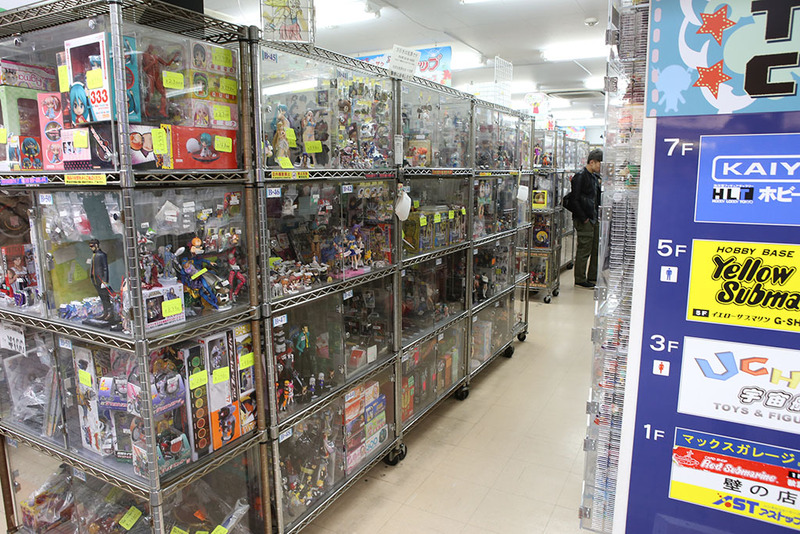 It has well over 400 machines carrying toys of all types. You bring (or change) in a ton of 100Yen (~$1 usd) coins and get to work. 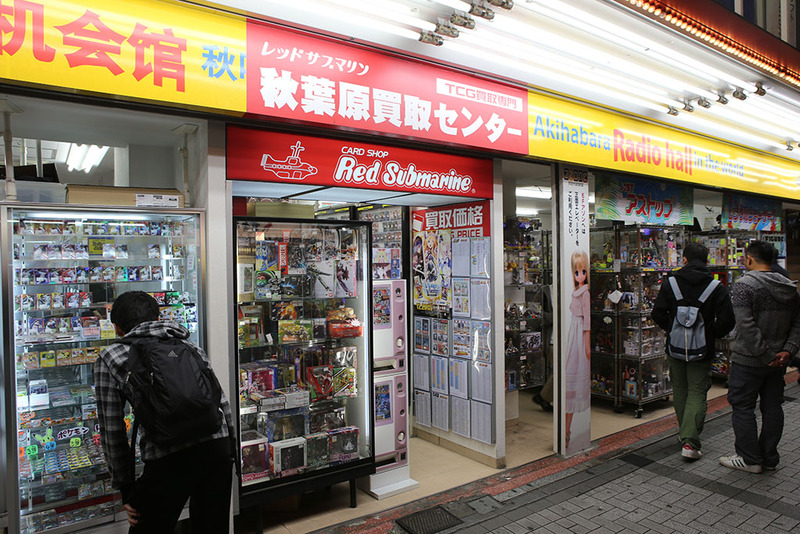 You’ll find all kinds of toys here – from fake tiny plastic food, realistic looking animals, anime characters such as Evangelion, and some completely what-the-heck-is-this stuff. You simply plunk in your coins and start cranking. 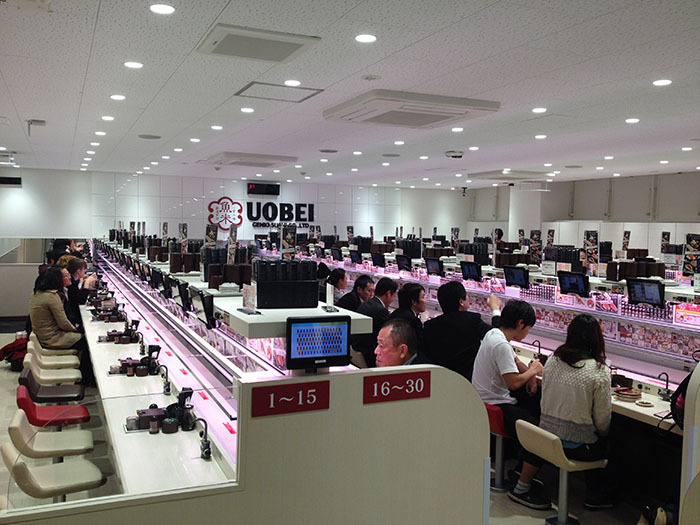 Prices range from 100Yen to 500Yen per machine with the majority in the 200-400Yen range ($2-$4USD). So, it’s not for the cheap of heart. I think I blew about $20-30 here but it was an absolute blast. 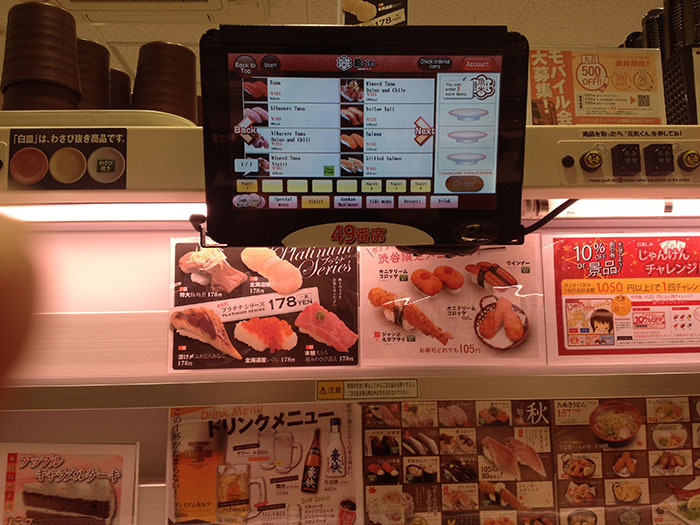 Far, far better quality than the toys you get from the grocery store machines in the states when I was a kid. For those with less adventuresome spirits but a collectors heart – there is also the option to go to the front counter and buy a bag that contains all the toys for a small premium above the per-unit price. For those wishing to get a whole set without getting 5 of the same thing – this is cool. There are also some rental display cases here from people selling their extras as well. 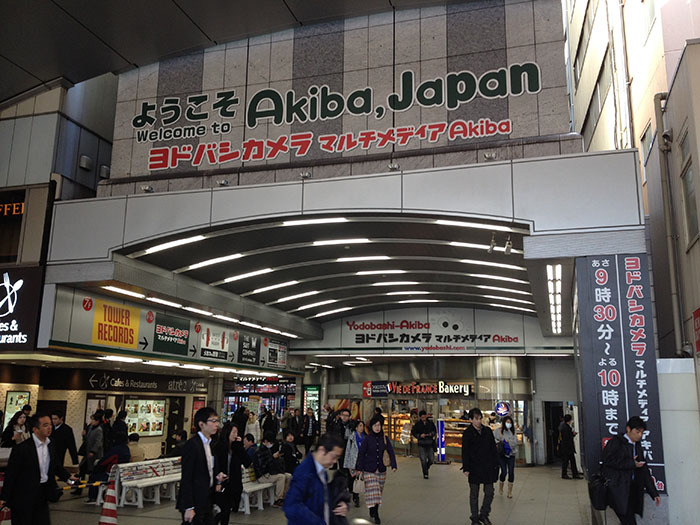 But onward – more Akihabara to explore! So, one of the biggest useful tools when in a strange place is being able to use your cel phone. Looking up maps, bus, and train schedules saves you oodles of headaches, frustration, and lost time you could spend exploring and enjoying your trip. 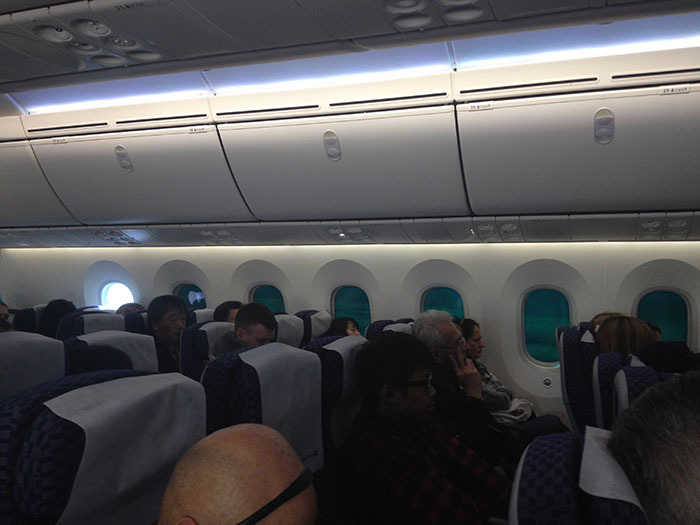 But using a cel phone abroad is also full of horror stories. 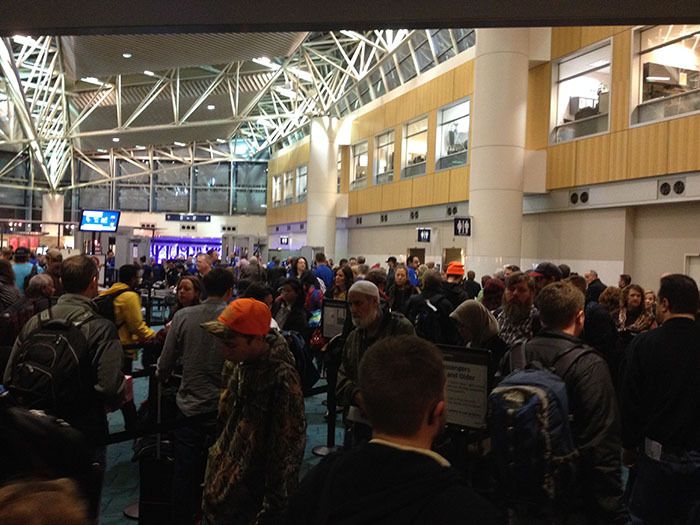 People arriving back home with $1000 bills for roaming charges. So, off to the forums to read about it. Turns out my current carrier AT&T offers an international 300MB plan for $60 and 600MB plan for $120. That felt a bit steep for me as a friend who went for a week said that 300MB was barely enough for 7 days. So, I started digging around on traveling forums and found a variety of companies. Googling tends to pop up lots of different companies with many options. Some will rent you a whole phone for your trip. Some rent SIM cards that replace your current one. Others rent wireless hubs which you can tether your cel phone and/or PC and other devices. 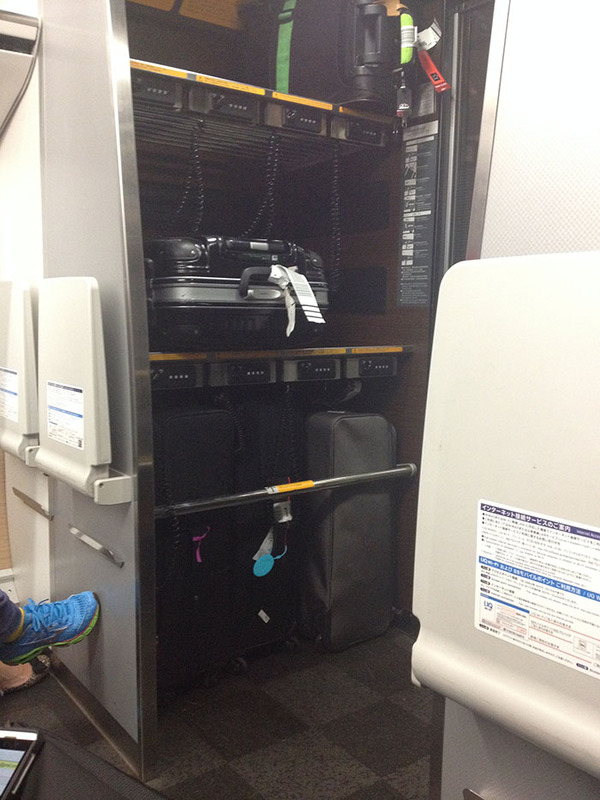 Depending on what you need and how long your trip is, there are lots of options. If you are staying a long time (month+) and want to actually get a Japanese phone plan, you usually need to show a vista that indicates you have at least 90 days of stay left before they’ll let you get one so you don’t leave the country with their phone. The tricky part about these companies is that half of them look like scams – and others are full of fine print. Softbank comes up top on many searches for renting sim cards for your phone in Japan. Seems like a good deal, $1/day minimum, 0.31 cents/packet with a $15/day max that then covers unlimited data. Sounds pretty good. Um, but a packet is 128 bytes so you hit the $15 max in 620,000 bytes, or about the size of one jpg image. In other words, you’re probably going to pay $15/day if you even turn it on. A 10 day stay will then run you $150 – which is worse than the plan from AT&T. Instead, I dug around on the forums and found these guys: eConnect. These guys offer 1gb of data for a flat 4100 yen (or about $40). What you are doing is renting/buying a SIM to replace the one in your phone. They also have phone/text plans, as well as separate WIFI hubs for those with bigger needs/more devices. I opted for the $40 data only SIM plan since I didn’t need to make phone calls and could send emails instead of texts. The offered SIM and micro-SIM cards. Since I had an iPhone 4S – standard SIM worked for me. Unlock your phone. If you can’t unlock your phone, the SIM option is off the table for you. My iPhone was just out of the 2 year contract period on my AT&T account, so I chatted with their support and they sent me to a link to submit an unlock request. Wow – they use every excuse under the sun to avoid unlocking it. I sent in the unlock request, and was told it might take them 1-3 days to respond. Fortunately, it was more like 4 hours. I got an email stating it had been processed for unlocking, but that I needed to wait 24 more hours before running the procedure. I wait 24 hours, run the procedure (which requires resetting your iPhone to factory defaults for one), and then verify it is unlocked using the IMEI website (despite it’s completely scam-y appearance). Long story short, give yourself 3-5 days to get your phone unlocked to be safe. Don’t leave this till last minute in case their are difficulties. Get your package. 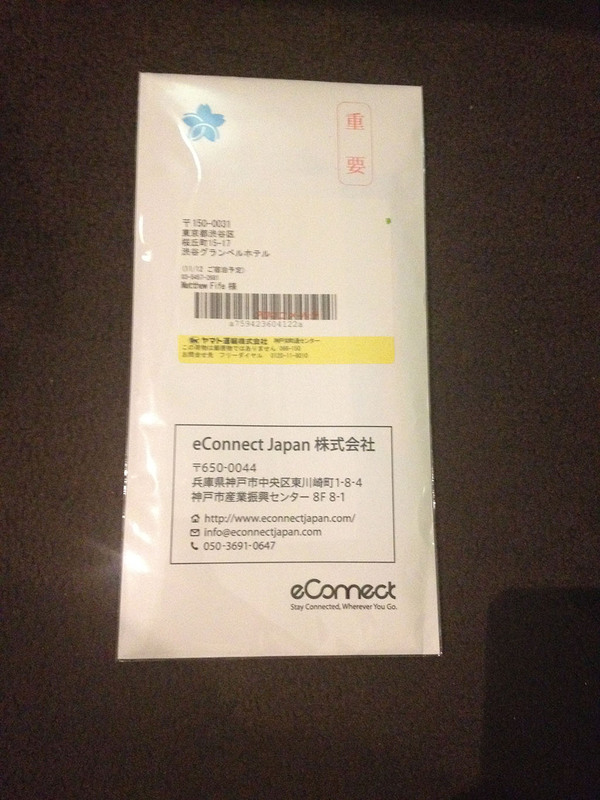 The kit is just a small mailing envelope with instructions and the card. 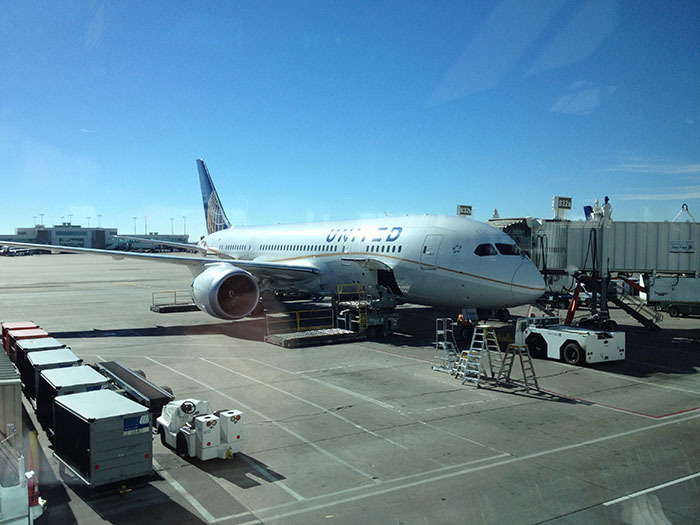 eConnect lets you either pick up the package at their airport kiosk or have it delivered to your hotel. 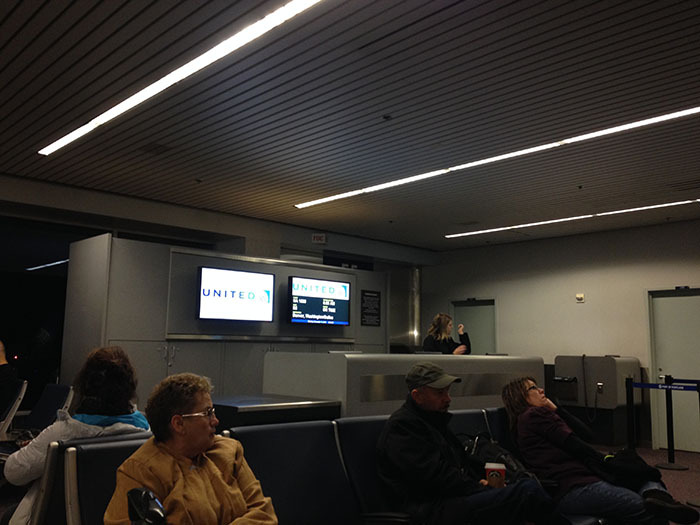 If you opt for airport kiosk pickup, be sure that the kiosk will be open when you arrive! Many are only open 8am-8pm and so forth. 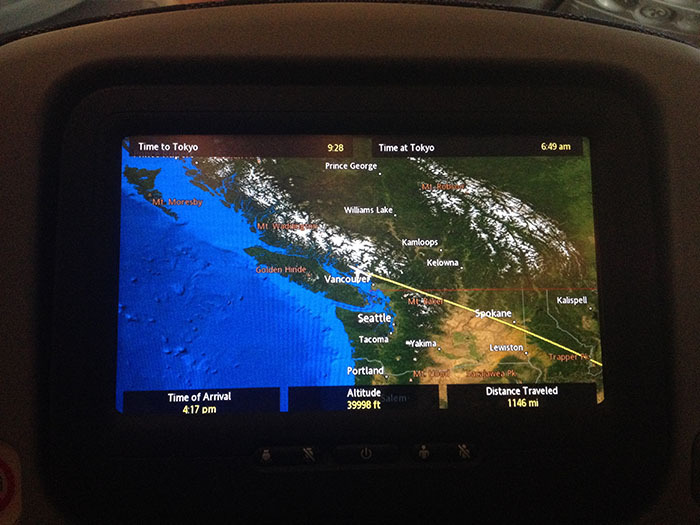 Be sure to account for flight delays or you’ll find yourself going back out to the airport the next day. I opted for the hotel route and it was waiting for me when I arrived. It takes them about a week of lead-time to get it delivered via normal mail, so again, don’t do this the day you plan to leave. Insert the new sim – I was a little surprised to find what looked like a credit card inside the package. But you snap out the sim from the card mounting and it is in fact a normal SIM card size. Popping out an iPhone 4S SIM is fairly easy and you can find youtube videos for just about every major phone if you look, but I did need a pointy tool for mine. 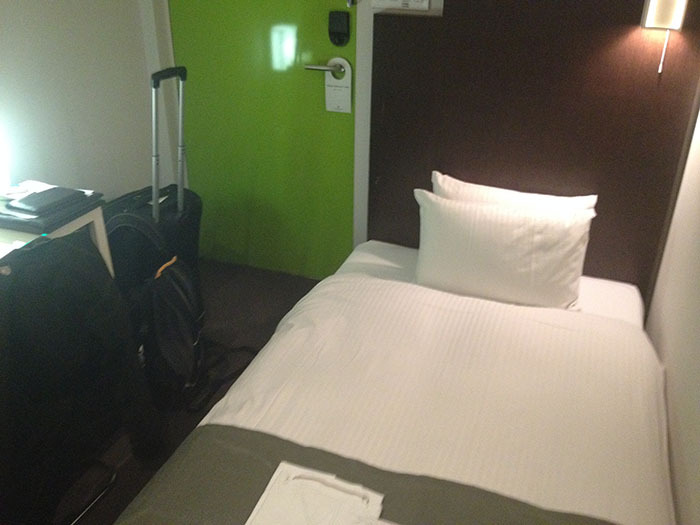 Turns out a paperclip works fine – but there wasn’t one to be found in my hotel room. I actually brought my own paperclip pre-bent for this purpose. I highly recommend you make sure you can get your sim in/out before you leave. The first time I tried to get my SIM card out, it was very stiff and I had to initially pop it free with a an actual tool. You don’t want to arrive there and find you need a tool you don’t have. It’s at this point that you can convert a regular SIM card to a microSIM if you need to do the surgery. eConnect actually offers microSIM’s, but not all carriers do. I talked to one fellow on my trip who actually brought his own scissors and file and successfully managed it for his Android phone when his Australia-friendly plan only offered regular SIM’s. I didn’t have to do this part since mine used a standard SIM card. Set up the network password – So, I put the old SIM into the included zip-lock bag for safekeeping (you are going to need it when you get back home! ), and turned the phone on. Success! But you do have one final step. 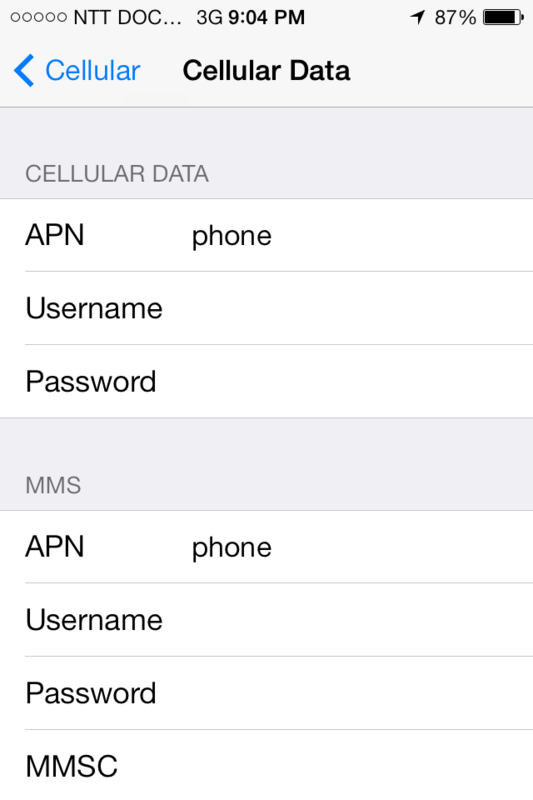 You need to go to the carrier settings and set the APN username and password. The instructions included were very straightforward and easy to follow. I entered the data and waited. It did take a little bit for the phone to register itself with the network the first time. Probably a good 5 minutes. In fact, if I turned the phone to airplane mode during the day to avoid using up data, it usually took about 1-2 solid minutes before it would pop back onto the network. 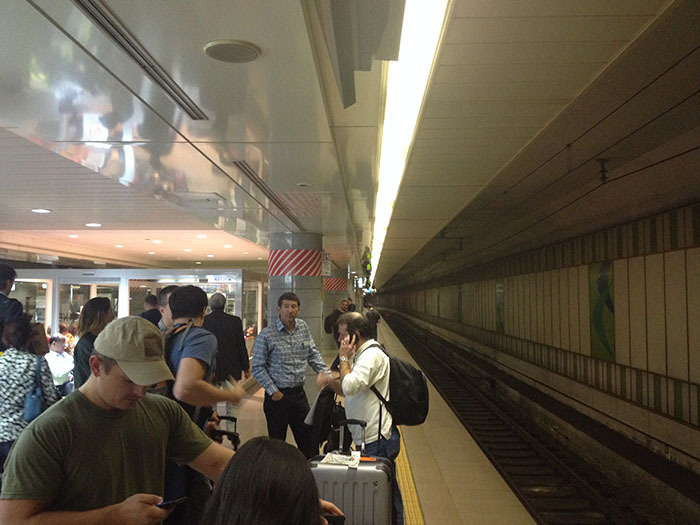 But soon enough in the upper left corner I saw not my old AT&T logo but NTT DOCOMO. I never got any signal strength bars but it did work fine. Coverage was great all across the country where I traveled – even out in the remoter areas in the mountains around Takayama. Enjoy! I was very conservative with my phone use at the beginning. 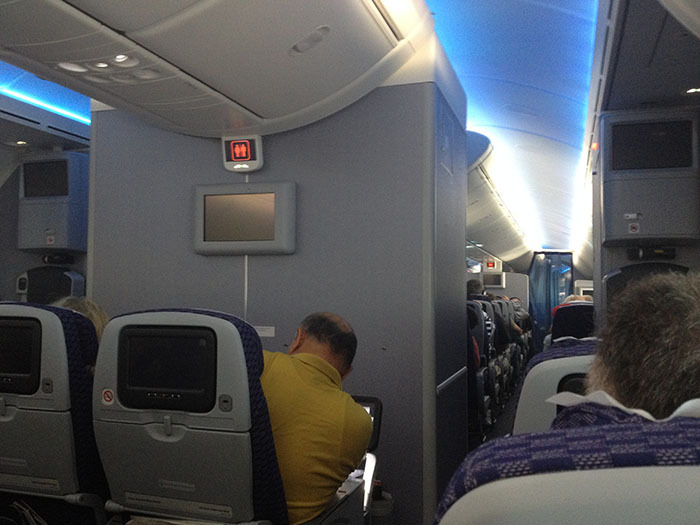 I would turn the phone to airplane mode when not using it. I also only looked up train schedules and maps. In this mode, I used only a few dozen megabytes per day – anywhere from 10-30mb. 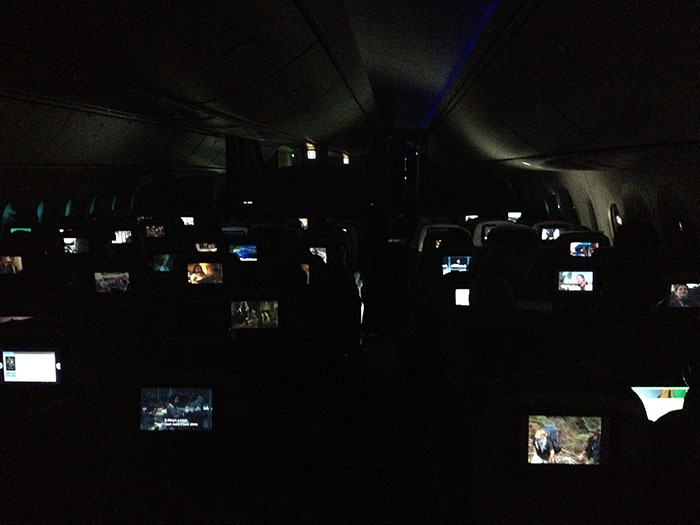 Later, as I got closer to the end of my trip, I even did a little bit of facebooking, left it on more during the day, etc. Those days I got closer to about 100mb/day. In all, 1GB for a 14 day trip was just about right. I ended up using about 700MB of my 1GB by the end. Shipping the SIM back (not required in my case). 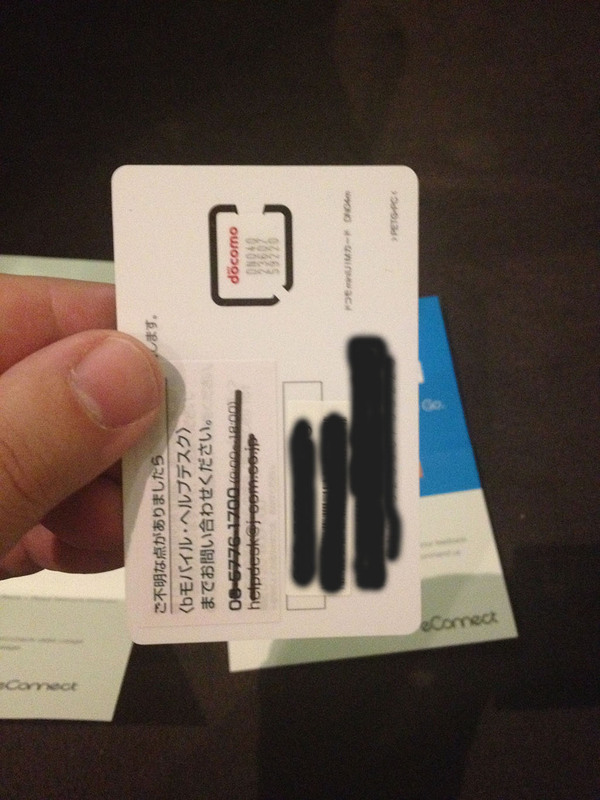 Some companies require you to actually ship the SIM card back to them when you’re done. eConnect didn’t and that’s one less hassle to deal with on your leaving day. 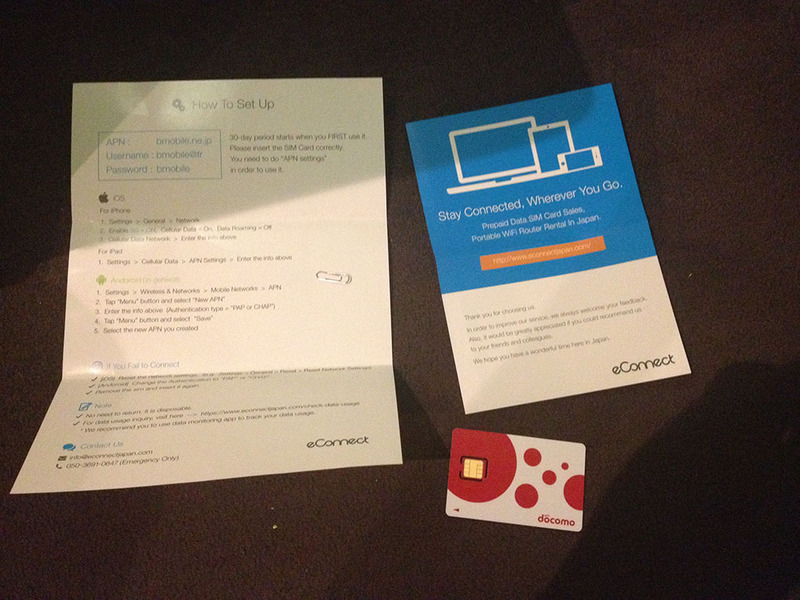 Overall, using eConnect was a great experience and I’d totally use them again. If you’re going to use over 1GB of data, they actually recommend you buy multiple SIM cards and use them back-to-back. 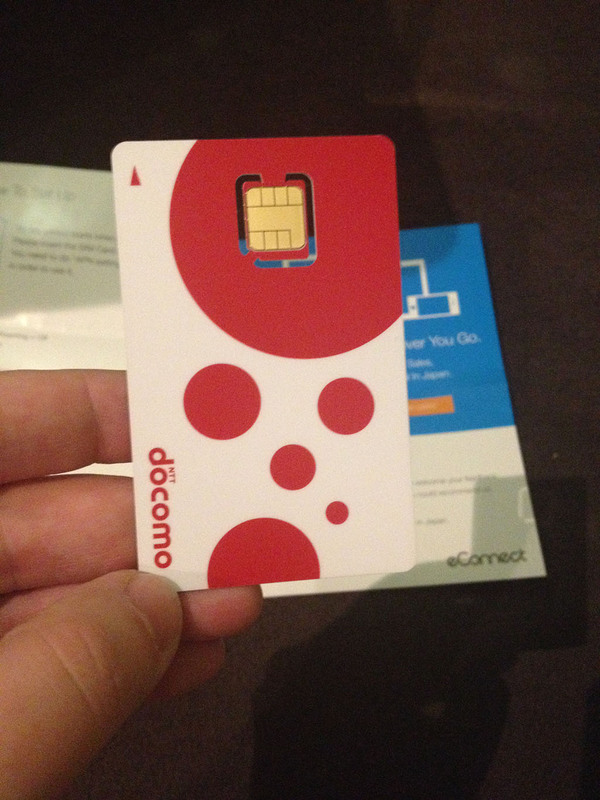 eConnect SIM cards are only good for 30 days from first use. So, they are use-it-or-lose-it deals. Hence another good reason to just buy multiple cards and just insert more as you use them up. Man, I really wish it were this easy and cheap in the US. Just another example of the terrible phone companies we have here when you see how amazingly easy and cheap it is in other countries.